From our inception through 2017, Park Players performed at the North Rosedale Park Community House, which was built in 1939. 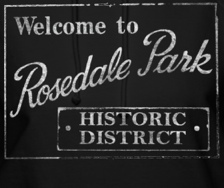 We were born in the center and the heart of the historic and lovingly maintained North Rosedale Park neighborhood (which has a very colorful history dating to the 1920s). In addition to being the home of the Park Players, the community house serves the various neighborhood groups - from the girl scouts to the ski club - and is also the home of the North Rosedale Civic Association, a community organization that sponsors the annual house walk and other events, which are open to the public and showcases the neighborhood’s beautiful homes, curving tree-lined streets, stunning architecture and gardens. The Park Players of Detroit have been presenting theatrical productions without interruption since the early 1950s. Like Detroit, the Park Players have undergone tremendous change. What started as a restricted group for residents of the exclusive Detroit neighborhood of North Rosedale Park – with the group’s first show being a minstrel show – has grown into a multi-cultural and diverse community theater group with membership from all across S.E. Michigan. The Park Players of today feature a policy of racial- and gender-inclusive casting, and the group specializes in producing thought-provoking theater and musicals. Some of the recent past productions include Palmer Park, The Laramie Project, Dead Man Walking (in conjunction with Divine Child High School), The Wiz, To Kill A Mockingbird, Joseph and the Technicolor Dreamcoat, Moon Over Buffalo, Smoky Joe’s Café, Ragtime and One Flew over the Cuckoo’s Nest. If you’re looking to expand your horizons, have talents waiting to burst forth, or you’re just looking for a few new friends, join the Park Players. The Players include actors, stagehands, set designers, set constructors, costumers, makeup artists, musicians, and theatre lovers. New members are always welcome - young or old. And you don’t have to be a resident of the neighborhood to belong…we have members from all over the Detroit Metro region.